The State Transport Authority (STA) on Monday said it would issue directions to cab aggregators to restrict the working hours on their platforms in the interest of drivers and commuters. ADGP and Commissioner for Traffic and Road Safety P S Sandhu, member of the STA, said they have received complaints from drivers that they are overworked. “Overworking and exhaustion will invariably lead to accidents. World over, there are rules prescribing the hours of work for drivers. Cab aggregators should limit the working hours on their platforms,” he said. Sandhu, along with Transport Commissioner and STA Chairman V P Ikkeri, briefed the media after receiving petitions from two associations of drivers, who opposed the move to revoke the suspension of Ola’s licence. About 300 taxi drivers took part in a meeting with the STA, where they aired their grievances. “Ola and Uber should prescribe maximum working hours and give minimum earnings for eight hours as per the rules. The interest of drivers, not just commuters, should be kept in mind during their everyday operations,” said Somashekhar K of Namma Chalakara Trade Union. 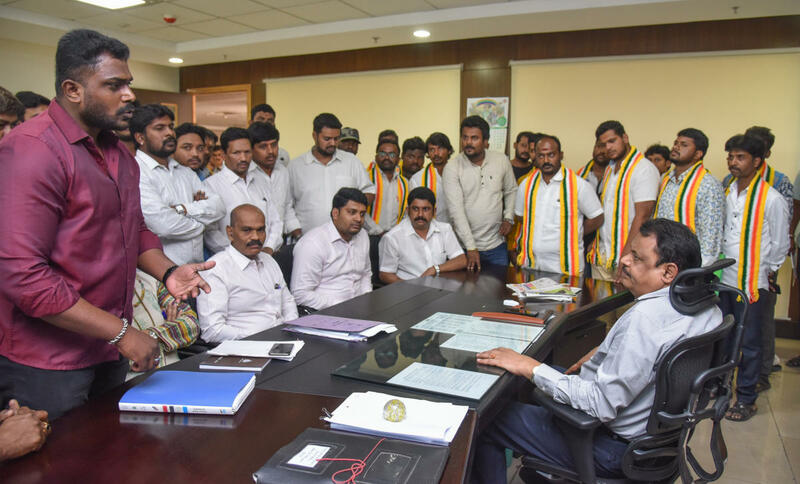 Tanveer Pasha, leader of another union associated with JD(S), said the STA had assured them of calling a meeting of drivers at the earliest to resolve some of their problems. “We are not happy that the ban on Ola has been lifted. However, keeping the election code of conduct in mind, we have decided not to stage a protest,” he said. The drivers expressed anger against Social Welfare Minister Priyank Kharge, Transport Minister D C Thammanna as well as Chief Minister H D Kumaraswamy, for their “quick reaction” to save Ola. “Where were they when we were protesting on the roads? How come the ministers stress for creating a convenient environment for investors and not for labours,” asked Somashekhar, whose union held a protest against the ministers in front of the Transport Commissioner’s office. Drivers shouted slogans that cab aggregators need more regulation and not leniency. “We want minimum earnings, not incentives. We want safety on road, not targets that push us to work for more than 15 hours,” they said. Pink taxis: safer commutes now? Boy, did Uber, Ola take us for a ride!